Sté. Industrielle de Matériel Automobile was based in Courbevoie, Seine, and was active between 1924 and 1929. It was formed by the makers of SICAM, and used the same Marcel Violet designed 496cc flat-twin engine. The first cars had plywood bodies, tubular backbone frames and a 2 speed gearbox on the rear axle. 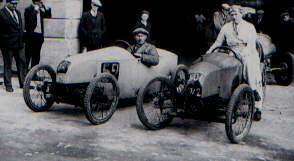 A few were fitted with 750cc engines for competition, and a 1.5 litre flat-4 Grand Prix car was built, finishing 3rd in the 1926 Boulogne GP. From the 1937 Boulogne GP - 500cc and 750cc class entries.